Action from Peterborough Sports 4, Deeping Rangers 1 in January. Sports are in blue. Two teams who have scored 273 United Counties Premier Division goals between them should serve up a cracking Hinchingbrooke Cup Final tonight (May 2, 7.45pm). Champions Peterborough Sports and runners-up Deeping Rangers go head-to-head at Yaxley FC’s In2itive Park. Sports were responsible for a remarkable 150 of those goals, but they will be wary of Deeping, one of only two sides to beat them in a league match in 2016-17. Action from Peterborough Sports Reserves' win over Deeping Rangers in January. Sports avenged that early-season 1-0 reverse at Outgang Road with a comprehensive 4-1 beating at PSL in January. The city side went on to finish 18 points clear at the top. On the slick artificial pitch at Yaxley, both sides will be confident of delivering a quality contest. Sports are defending one of the four trophies they won last season. Peterborough Sports Reserves are also in action this evening. 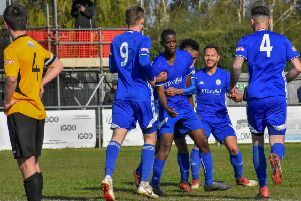 They require three wins from their final four matches to seal a first Peterborough Premier Division title and they have one of their trickiest remaining games tonight when travelling to Holbeach United Reserves. Second-placed Pinchbeck United also have a tough game at Stamford Lions. Hinchingroke Cup final: Deeping Rangers v Peterborough Sports (7.45pm In2itive Park). Premier Division: Stamford Lions v Pinchbeck United (7pm), Holbeach United Res v Peterborough Sports Res (7.45pm). Division One: Long Sutton Athletic v Spalding United Res (7.30pm), Netherton United Res v Warboys Town (7.30pm). Division Three: Sawtry Res v Brotherhood Sports (6.30pm). Premier Division: Sawtry v Langtoft United (6.30pm), Netherton United v Moulton Harrox (7.45pm). Division Four: Premiair v Cardea (6.30pm).